Use forms in liferay web content. When we need any form submission we need to create form in portlet and later we need maintain this data in one place but this can be done by developer but administrator can’t this. So for this reason we need to embed some forms in web content of liferay. Create forms and manage forms one place and using form in any web applications. HubSpot is one application where we can create forms and manage forms. Once we create form we can embed this forms in anywhere in the application. HubSpot one of the web applications so that we can create forms and manages forms. Internally it used Orbeon Form Builder Open Source for create forms and manage forms. Once you successfully created account you will get 30days free trail so that you can explore more here. Here we will consider only one part that is Form Creation, Manage Forms and Using Form from HubSpot. Once we click on form then we can navigate form build screen where we can create the forms. Now create form according to our requirement. We need to Click Create New Form button. Once we click then we can see form builder so that it having many option to create forms. It also provides some default templates to ready use and we can customize. Once we enter form name and we can select either form build from scratch or create from existed templates. Choice is up you. Assume we will select the option start from Templates. Once we selected template and click on create from then we can see form builder tool which have basic contact from template. Now we can add some new fields then we can save the form and we can publish the form. Once we design is completed then we need to save the form and before we can see the preview also. As of now we have designed the contact from now we need to get embedded java script code so that we can use this code in any application or any html page. Once we click on embed option we will get Pop Up there you can see the Java Script Code. This code can be used in Html page or application. We can give redirect URL so that after form submission it will navigate to specified web URL. Now we already create the form in HubSpot and we also get the from embed Java Script then we will use this embed Java Script in liferay web content. Login as Admin in liferay portal and go to add in the dock bar and add Web Content Display portlet to page. The following screen shows after admin login into liferay portal. Now we will design the web content and we need to add Form Embed Java Script to this web content. For this we need to choose CK Editor Source option so that we can see web content as HTML. The following is Add From Embed Java Script to Liferay Web Content. Once we done click on save then form will be available in Web Content Display portlet then we can submit form. Well we already done all the steps now where we can see the form data? 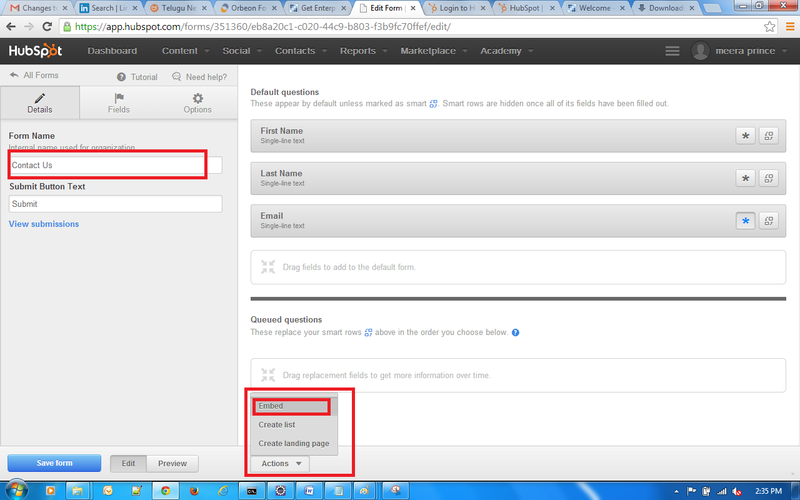 The following screen shows you List option in HubSpot. Once we click on List we can see all froms that we designed. If we click on any for respetcive submissions you can see. This is start point I just showed how use forms in liferay web content we can explore more and all the best. We can use this Form Embed Java Script in any HTML page. This form helps us more in Static websites. HubSpot is application there we can create forms, manage form submission data and use forms in other applications. We can use Form Embed Java Script in any HTML page so that we can submit the data. The submission data will be manages in HubSpot. HubSpot uses the Orbeon from Builder tool for create and manage forms and it complete open source java based technology. Interesting one liferay also used HubSpot from in their website. The following is link to see HubSpot forms in liferay.